When you go to the grocery store and glance down the refrigerated aisle, you’ll see meats, cheeses, yogurts and much more. People know these foods need to be refrigerated, but there are quite a few items that people debate over. While everyone has their preference, these do’s and do not’s for refrigeration will come in handy the next time you’re putting away the groceries. Eggs- You need to refrigerate eggs due to threat of salmonella bacteria. Some other countries in the world like the UK don’t need to refrigerate eggs because they use a different processing process. Cheese- Most soft cheeses like ricotta should ALWAYS be refrigerated. You can get away with not refrigerating Parmesan or Romano, but make sure you always check the instructions. Soy Milk- This popular healthy form of milk needs to be refrigerated after opening. It can last for about a year in storage, but once it is opened, it won’t last more than a few hours without the refrigerator. Tomatoes- Keeping tomatoes in the fridge is pointless and it actually has a negative effect on their taste. The colder temperatures make them ripen slower and this actually gives them that mealy taste. That is why you should only buy tomatoes when you know you’re going to use them. Onions- Onions will soften if they are kept in the fridge and that will eventually lead to them becoming moldy. Store them in a bin or container in a shaded part of your kitchen for the best taste. Bread- If you don’t plan to eat bread within a week of purchase, wrap it up and store it in the freezer. The fridge won’t prolong it’s life long enough to cancel out the negative effects it has on the taste of the loaf. Nobody likes dry bread! At Speedy Refrigerator Service, it is our job to make sure your refrigerator is working order. We provide one hour emergency service to the NYC, Long Island and Queens areas 365 days a year. We know refrigerator malfunctions don’t work around your schedule, but we do! To schedule service, call 866-782-9376 or click around on our website. Webster’s gave us the responsibility of designing a dictionary specifically for our industry. They said they wanted the team who had 75 years of experience to lay out a few terms that homeowners should know about the most important appliance in their home–the refrigerator. 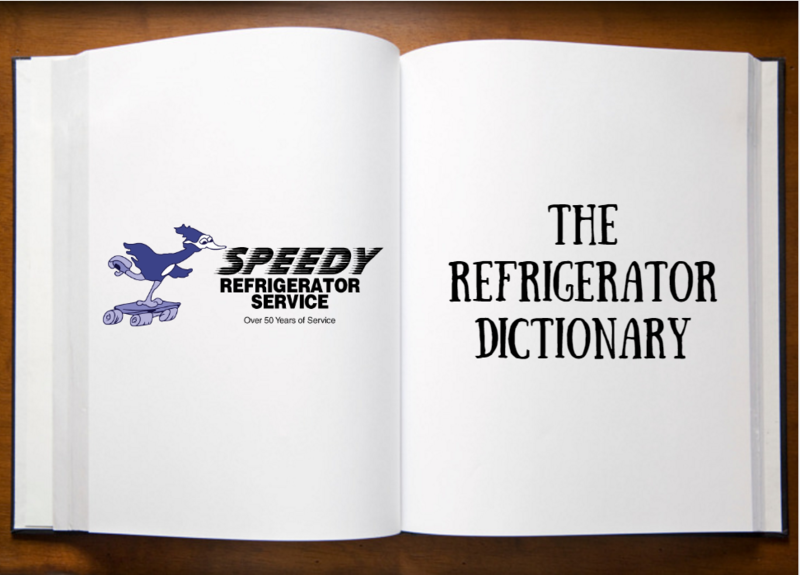 So here we go with our first edition of the Speedy Dictionary for Refrigerators! Compressor: This is the powerhouse of your entire unit. The compressor compresses low pressure gas into high pressured gas to adjust its temperature. Once this process is complete, it moves into the condenser for the next step of the process. Condenser: This is where all the magic happens. This part of your fridge condenses that gas from the compressor into a liquid refrigerant that helps keep your refrigerator cold. Crisper Drawers: This is how you keep all those fresh fruit and veggies from spoiling. These drawers are usually located on the bottom of your refrigerator with adjustable humidity settings for specific types of produce. Make sure you take good care of these drawers however, they collect bacteria rather quickly. Gasket: This is the rubber lining that works it’s way around the door of your refrigerator. While it might look unimportant, it is actually crucial to maintaining an efficient refrigerator. It locks that cool air in and a faulty gasket needs to be dealt with immediately. Drain Pan: Your drain pan is located out of sight next to your compressor and it has a very important job. It collects all of the excess water that is left over after the defrost cycle so that it doesn’t wind up on your floor. Energy Rating: This is important for those environmentally conscious homeowners out there. Energy Star rates your unit on a scale from A-G based on how well it operates in normal conditions. The higher the rating, the less energy is consumed. Our expertise gives us the ability to fix any refrigerator problems, big or small. We are New York’s premiere refrigerator repair service and we have been helping customers in the area for the past 75 years. We handle all makes and models so don’t hesitate to give us a call the next time you are having trouble. To schedule service, call 866-782-9376 or click around on our website! Your refrigerator likely lies in your kitchen, so you could eliminate the threat by denying your child unsupervised kitchen access. Bring in one of your handy baby gates and block off the entrance, or entrances into your kitchen. This will ensure your child’s safety from the refrigerator and all of the other hazards that lie in your kitchen drawers. A little Game of Thrones reference for all you fans out there! But instead of holding the door against the living dead, you need to hold the door against your little guy/girl. There are various different door locks on the market to help you with this task. Button-Strap Lock: This lock is easy to install and easy to remove, but that could be a problem. It holds the door shut with adhesive that wears out over time. It is cheap and easy, but that doesn’t mean it is the best solution! Padlock Fridge Lock: This lock is durable and very difficult for a child to break. The downside is that it can be a nuisance to undo every time you need something from the fridge. Clip Strap Fridge Lock: This lock easily holds french style doors closed with the help of a simple strap. This lock is not uncrackable, but it can keep most babies out and it is easy for a parent to remove. The last thing you need to lock down is your refrigerator’s water dispenser. This isn’t necessarily dangerous for your child, but it can cause a big mess that you don’t want to clean. Look inside your owner’s manual and search for the lock settings on your dispenser. Most new models will have this feature and it can go a long way to keeping your floors nice and dry. 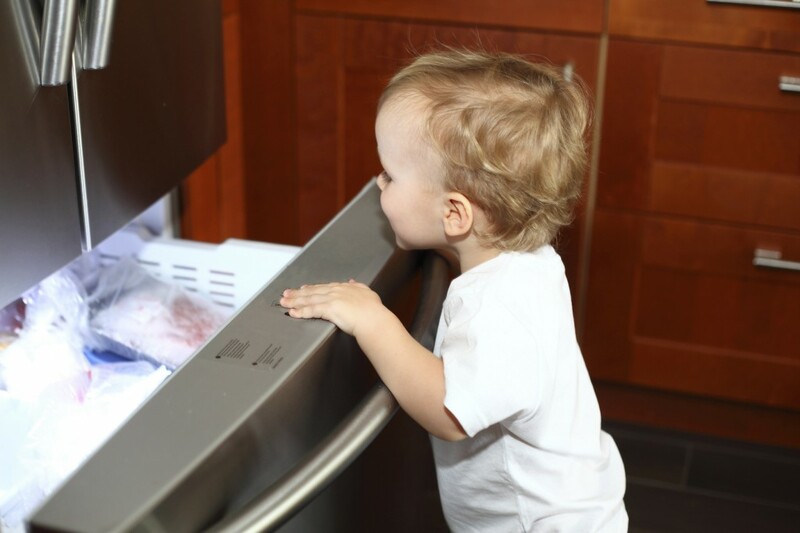 At Speedy Refrigerator Service, we keep your refrigerator running so you’ll always have something to baby-proof. We can fix leaks, electrical problems and much more with the help of our warehouse on wheels. When we arrive to your home, our trucks are already stocked with all the parts you’ll need so we can get the job done quickly and efficiently. The absolute worst thing that can happen to a refrigerator is a loss of cool air. When you have a loose seal, that is exactly what happens and it causes your refrigerator to work even harder to cool down your food. This overexertion can lead to other problems and you need to put a stop to it before it progresses. Check your seals every 4-6 months and feel around to make sure no cold air is escaping. If your refrigerator coils are covered by dust and debris, it is nearly impossible for your unit to run properly. When it tries to, it will lead to overheating and some costly repairs. Every 4-6 months, you should pull the fridge from the wall and clean the coils located underneath or behind your unit. The proper temperature is essential to getting the most out of your refrigerator. Setting the unit between 37-42°F is ideal for maximum efficiency. But don’t trust your thermostat! When you perform your other maintenance, you should also put a standing thermometer on the shelf and double check the temperature inside your fridge. It’s debatable, but most studies show that filling up the refrigerator does improve efficiency. Adding more ‘stuff’ to your fridge helps to absorb the heat from the outside air and it makes your refrigerator’s job much easier. If you have a lot of empty space inside, fill it up with water bottles to compensate. If your power goes out, make sure your refrigerator remains sealed for 48 hours. This will keep your food fresh before you have to move it into a cooler. At Speedy Refrigerator Service, we pride ourselves on saving the day from refrigerator malfunctions. If your maintenance wasn’t enough, just give us a call and we will be at your NYC or Long Island home in one hour or less. To schedule service in Nassau County, Suffolk County or Queens, call 866-782-9376 or click around on our website! Pie season is upon us and we are extremely excited about it! There is nothing better than coming downstairs to the smell of a delicious fall pie in the oven. Whether you’re a blueberry lover or passionate about pumpkin, there are always going to be some leftovers (maybe not always…) But when there are, you need to be careful about how you store them in your refrigerator. These pies contain eggs in their filling, so refrigeration is a must. If you’re trying to knock the preparation out of the way, you can do it during the week and store the pie in the fridge for four days before serving. Be sure to wrap the pie in aluminum foil and set the refrigerator temperature to right around 38°F. Your blueberry, cherry, raspberry and any other kind of berry pies fall into this category. After they’re baked, they can remain covered at room temperature for up to two days. After that, move them to the refrigerator for another two days of storage. If you can’t finish them in that four day window, then maybe you need a new recipe! These pies are simple and easy to make and they always seem to be a fan favorite. They tend to be a little lighter on the stomach than traditional pie and people appreciate that after a long meal. As for storage, they can’t be frozen, but they can be covered in the fridge for up to four days. Oh, and a little tip. Don’t put the whip cream on top until you’re ready to serve! 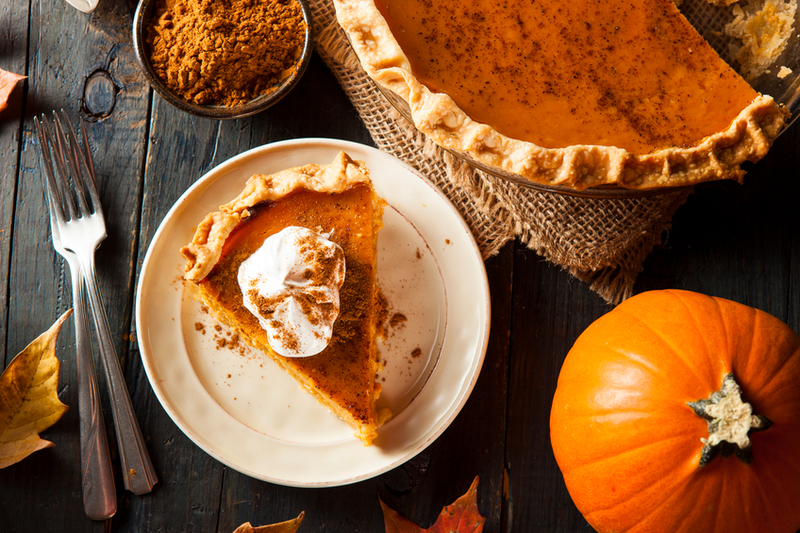 If you follow these guidelines, your pies should be even tastier the next day. The only thing that can derail you is a faulty refrigerator but those are a thing of the past. Just call Speedy Refrigerator Service and we’ll be there in one hour or less! If you throw in some pie, our guys might even make it a half hour.